THE ASTRONAUT SCHOLARSHIP FOUNDATION (ASF) selected University of Kentucky senior Corrine Faye Elliott as one of this year’s 40 recipients of the prestigious $10,000 scholarship. The ASF Scholarship is presented annually to outstanding college students majoring in science, technology, engineering or math (STEM). Earlier this year Elliott was awarded the Goldwater Scholarship, which recognizes outstanding students who wish to pursue careers in the fields of mathematics, the natural sciences and engineering. ASF has awarded more than $4 million to deserving students around the U.S. to date. UK students have earned a total of $171,000 from the ASF since 1998. The daughter of Kathleen Elliott and UK political science professor Stephen Voss, Elliott is currently majoring in mathematics and minoring in chemistry, statistics and computer science at UK. A passion for mathematics started early for Elliott, an interest in science, particularly chemistry, would come later for her. “From a very young age, I was fascinated by the logic and beauty inherent to mathematics; I never questioned adopting it as my field of specialization. My studies in chemistry came as a bit more of a surprise, arising largely from enjoyment of the research in organic chemistry that I undertook in my junior year of high school and never abandoned,” Elliott said. Corrine Elliott, a senior majoring in mathematics and minoring in chemistry, statistics and computer science, works closely with Associate Professor Susan Odom in her organic chemistry lab. 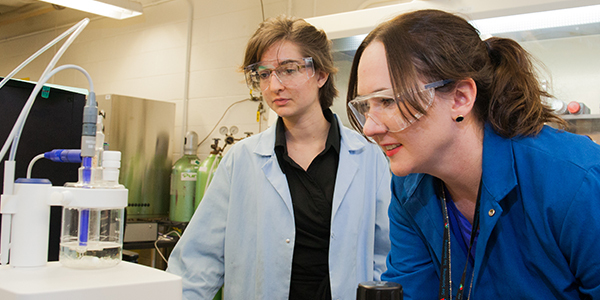 Corrine Elliot, a senior majoring in mathematics and minoring in chemistry, statistics and computer science, works closely with Associate Professor Susan Odom in her organic chemistry lab. Elliott has been encouraged by family and educators alike to pursue her STEM studies. She grew up in a family headed by two teachers and an older brother, UK medical student Gareth Voss, who created an educational environment at home. In high school, Elliott enrolled in the STEM magnet program, the Math Science and Technology Center, at Paul Laurence Dunbar High School in Lexington, which allowed her to delve deeply into mathematics and encouraged her to get involved in scientific research. The third major event for Elliott was being accepted to work in Assistant Professor Susan Odom’s organic chemistry research laboratory at UK. During her high school years, Elliott’s research with the Odom Group focused on the synthesis and characterization of organic molecules for use as redox shuttles in lithium-ion batteries, and later on battery fabrication and analysis. Odom went on to encourage Elliott to pursue her more recent undergraduate research that brings together her studies in both mathematics and chemistry in the field known as computational chemistry. “Dr. Odom has invested a great deal of time and energy in supporting my research and my education more generally. She is a fantastic mentor, simultaneously guiding me and allowing me the freedom to conduct the research I care about, most notably by encouraging my initial forays into computational chemistry so that I could build a bridge between my internship and my scholarly interests,” Elliott said. Elliott also is grateful for the guidance and assistance of two other mentors at UK, her advisor Grzegorz Wasilkowski, professor of computer science, and Chad Risko, assistant professor of chemistry. Last summer, Elliott advanced her research with funding from a fellowship from the Organic Chemistry Division of the American Chemical Society (ACS). Her research proposal, “Steric Manipulation of Electrochemical Potentials in Conjugated Organic Molecules,” involves the design of synthesis of phenothiazine derivatives targeted at overcharge protection of high-voltage cathodes in lithium-ion batteries. The proposal is based on preliminary results found under the guidance of research with Odom and Risko. Elliott will earn her bachelor’s degree in mathematics this May. She is also currently pursuing a master’s degree in statistics as part of the University Scholars Program at UK. As part of that program, Elliott will likely complete her master’s degree by May 2018.